New Delhi, May 21 (PTI) Batting legend Sachin Tendulkar conducted a special screening of the much-awaited film on his life, 'Sachin A Billion Dreams' for the Indian Armed Forces personnel at the Indian Air Force Auditorium, here. At the special screening held yesterday, Honorary Group Captain Sachin Tendulkar was joined by Air Chief Marshal B S Dhanoa along with personnel and their families from Indian Air Force, Indian Army and Indian Navy. The batting maestro's wife Anjali Tendulkar was also present at the screening. The movie was received with a standing ovation followed by chants "Sachin Sachin" from the personnel present. Tendulkar was presented a memento by Air Chief Marshal Dhanoa on the occasion. Tendulkar also met and greeted the families of the Armed Forces present for the screening. Appreciating the film on Tendulkar's life, Air Chief Marshal Dhanoa said, "It was a wonderful film. Having joined the Air Force before Sachin started playing cricket, I have seen his whole career and it is really very inspiring." 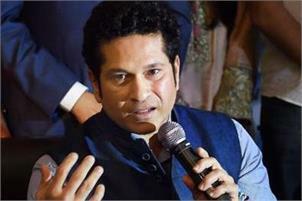 The Air Chief Marshal also told Tendulkar that the movie was releasing on a very significant day, as May 26 was also the day on which Air Operations commenced during the Kargil Conflict. He recalled he was stationed in Srinagar during the conflict when India beat Pakistan in the World Cup match at Old Trafford, England, and how upbeat they had all felt. The 1999 match in the Super Sixes was probably the first time that the two countries played against each other when the two nations were engaged in a war like situation at the same time. It was India's third consecutive World Cup win over Pakistan. Thanking the Indian Armed Force personnel and their families for attending the screening of the biographical drama based on his life, Tendulkar said, "It was on this very same podium that I was made a Honorary Group Captain of the Indian Air Force. "When I finally agreed to the film after a lot of convincing from my producer, I was clear in my mind that if I do this movie the first viewing has to be for the Indian Armed Forces." He thanked the Indian Armed Forces for protecting the nation from adversity and allowing him to fulfil his dream of holding the World Cup in his hands. "I am standing in front of you on behalf of a billion plus people of this country to thank you for your contribution for keeping the country safe. You are the real heroes," Tendulkar said.